This column was rejected by the new editor of Game News because of what he considered to be controversial content. No doubt he knows his audience. But I would like to put this column out for my web readers who may find it useful and may, like me, wonder why so many people are willing to believe that their domestic pets have minds but not wild animals who, we must admit, have much harder lives to live. Surely we have all evolved from the same beginnings, and surely that means that other mammals, like us, as well as birds and other creatures, must have minds that resemble ours, even if they are not nearly as well-developed. On the other hand, many of these species have lived longer on this earth than we have. If you call someone a “bird brain,” you are paying them a compliment. Birds, especially those in the Corvid family, have brains that weigh almost as much as ours do in relation to our total body weight. Our brain weighs three pounds or 1.9% on average of our body weight. Ravens and most crow species have brains that make up 1.4% of their body weight, although the super learners in the Corvid family—New Caledonian crows—possess brains that comprise a whopping 2.7% of their body weight. These percentages compare with those of similar-sized mammals such as small monkeys. Other bird species, even smaller songbirds like chickadees, also have amazing brains. These discoveries and many more have been recently pulled together in Gifts of the Crow: How Perception, Emotion and Thought Allow Smart Birds to Behave Like Humans by Dr. John Marzluff and Tony Angell and Bird Sense: What It’s Like to Be a Bird by Dr. Tim Birkhead. Both of these books are written for a general audience but they make use of dozens of scientific papers with such titles as “Stress, Corticosterone Responses and Avian Personalities” (my italics) by J.F. Cockrem in the Journal of Ornithology and “An Intelligent Crow Beats a Lab” by A. Straub in Science. 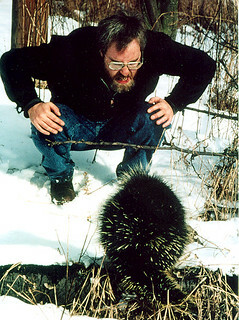 That’s what I did wonder one June morning when a large porcupine waddled toward me on the Far Field Road. I stepped off the road and watched as it advanced. Because of its whitish quills, it looked as if it had a halo over its shoulders. Once it paused to scratch itself. When it was almost abreast of me, it turned and crossed the road, headed in my direction. “Hello,” I said. It stopped and spread its tail to impress me with its quills. I continued talking quietly to it. Finally, it turned around and leisurely retraced its steps. Then it left the road and went into the woods where it slowly hitched its way up the largest chestnut oak tree beside the road. It flattened itself out on one of the highest branches overlooking the road directly above me, alert and watchful, until I moved on. 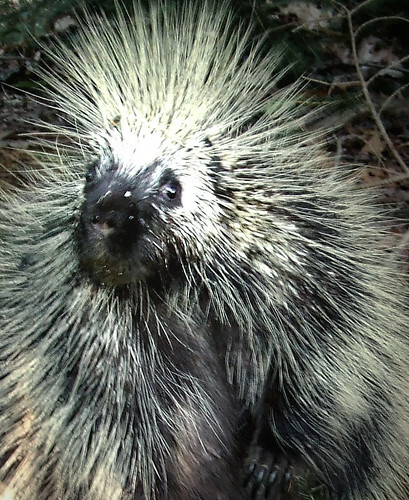 I’ve encountered numerous porcupines on our trails, and usually they hiss, spread their tails, and scramble up the nearest tree. But this porcupine, which looked like a grizzled old timer, didn’t seem fazed by me. Was it the animal’s age, experience, calmer temperament, or something else, I wondered, as I continued on my way. Several nights later, Bruce was awakened by a bang on the back porch below the bedroom. He got up, grabbed his flashlight, and went downstairs to investigate, thinking that maybe a burglar was trying to get inside. 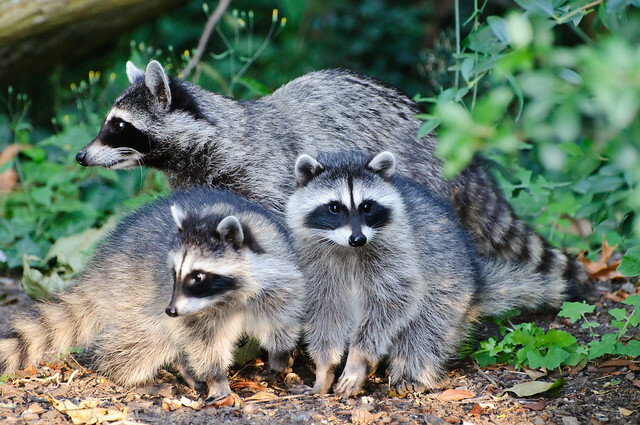 He tiptoed out to the kitchen, turned on the porch light, and saw not one but three masked bandits—a mother raccoon and her two kits. Since we had taken in our bird feeders two months before, he couldn’t figure out what they were doing as the little ones climbed up on the railing and the post that supported the porch roof. He shone his flashlight on first one kit, then the other, and finally on the mother but none of them seemed bothered by the light. He watched as they sniffed and explored. At last they climbed off the porch and trundled over to the outside cellar steps. Then one of the kits poked around in the grasses just below our sitting room bow window. That was when the mother raccoon noticed Bruce watching them. Or perhaps she smelled him through the screened window. She snarled loudly, but all three raccoons kept poking around in the underbrush as they made their way slowly toward the front of the house and out of sight. This time it was Bruce who wondered about the mind of a raccoon, and the next morning Dave solved the mystery. He noticed that a bald-faced hornet nest (Dolichovespula maculate), which had been attached to the porch roof, lay in gray tatters on the porch floor. In that case, the mother raccoon had been teaching her kits about one of their favorite foods. I was reminded of a Nature show I had watched on PBS about how cleverly raccoons adjust to and find food and shelter even in busy cities. According to raccoon researcher, Stan Gehrt, raccoons are incredibly adaptive. Even their personalities change from shy and reclusive in the country to bold in the city as they use their hand-like paws and mammal-sized brains to defeat humans’ numerous attempts to design raccoon-proof garbage cans. 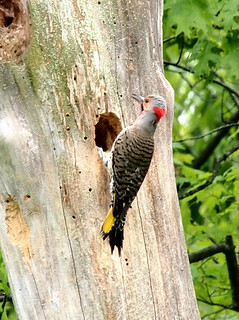 During last May and June Dave enjoyed sitting on his front porch and watching a yellow-shafted flicker family set up housekeeping in a dead elm tree at the edge of his yard. For more than a week in early May, the male and female took turns excavating the hole said to be 13 to 16 inches deep. Muffled knocks from inside the dead elm led to a flicker head popping out of the hole and flinging a bill full of wood chips into the air. Eventually, by mid-May, their excavation work was over, and the female laid her 5 to 8 eggs. Then the parents attended the nest in shifts, each one doing its share of work. They were due to hatch in 11 to 13 days. In the meantime, they fought off a pileated woodpecker, downy woodpecker, and another flicker, all coveting the nest hole, and reminding me of the many times I have watched flickers over the years try to establish a nest in a black walnut tree hole beside our driveway. Never once have they been successful because of gray squirrels who consider it their home. On June 12 Dave noticed that both parents were outside the hole at the same time for as long as 15 minutes, and he wondered if the eggs had hatched. The next afternoon he again saw both parents outside, and the male sounded agitated. The female sat on a dead elm branch a few feet above the nest hole. That’s when Dave noticed something sticking out of the cavity. It was the head of a black rat snake. Somehow the reptile had realized a meal awaited it 25 feet up the nearly smooth trunk of the dead elm and managed to climb it. It remained in the hole, digesting its meal until 10:30 a.m. the following day, and Dave watched as it spent 50 minutes slowly descending the tree trunk, seemingly studying all the alternatives each time before moving to a new knot, branch, or other protrusion where it could gain some purchase. It used a tall lilac shrub limb to move from the elm trunk to a dead branch that arched up from farther down the tree and then followed that branch to a lower spot on the lilac and on to the ground. 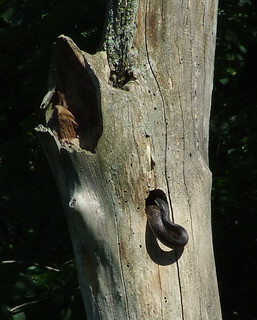 All of this reminded me of the most notorious article I ever wrote that was published in Bird Watcher’s Digest about watching a black rat snake get into and out of a house wren nest built inside one of our back porch posts. 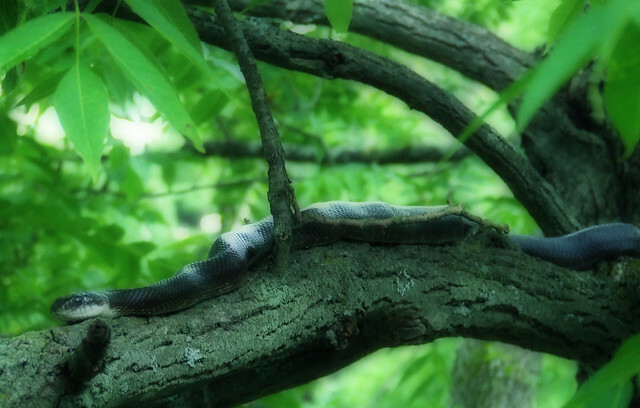 It took the snake one hour and forty minutes as it maneuvered up to our second floor, peered into windows, slowly lowered its body down the shingled porch roof and down the post into the nest. When it finally emerged, it worked even harder finding its way out by way of the drain pipe, down the post, and on to ground with many stops as it seemed to think its way past obstacles and over rough spots. As Griffin wrote, “mental events such as consciousness and awareness are indicated by surprising yet effective solutions to changing, unforeseen, and uncommon problems.” Both Dave’s snake and especially mine seemed to show such awareness. It had been a scolding Carolina wren, not the silent flicker parents, who sounded the snake alarm. And it was a Carolina wren who sang along with a mezzo-soprano in Massenet’s opera Werther, which Bruce and I were watching during a hot June afternoon. The wren was busy putting twigs in the gap next to our living room window air conditioner. I checked the pitch of both the soprano and the wren and realized they were performing a kind of duet. Was the wren challenging what it thought was a wren intruder or did it enjoy the music? This time I was reminded of a white-tailed deer that stood still outside our kitchen window years ago when I was playing Mendelssohn’s Elijah. She looked as if she was listening to the music. Our last bird observation went on for much of June when an eastern whip-poor-will chose our yard and Dave’s for his evening and dawn chorusing. A couple times he landed on the flat porch roof outside our bedroom window. Once when I was awakened by him at 5:00 a.m., I put my glasses on and snuck to the window where I had a view of him belting out his calls at deafening volume for about five minutes. He seemed so small to have such a loud mouth and reminded me of Dr. Seuss’s assertive Lorax in the way he stood. The whip-poor-will was, of course, acting as male whip-poor-wills always do in spring and early summer. I only wondered about him because he started later and stopped earlier than whip-poor-wills are reported to do. But then the life style of these birds is still poorly understood because of their secretive, nocturnal lives. No doubt they too are able to solve unexpected problems with enterprising solutions, the strongest evidence, Griffin concludes, that suggest animal consciousness. By early February, bird calls begin morphing into songs. In the “fee-bee” of black-capped chickadees, the “peter-peter” of tufted titmice, and the more complex, bright caroling of house finches, I hear the beginning sounds of spring. At first the resident birds seem unaffected by the weather. The overwintering song sparrow sings “hip, hip hoorah, boys, spring is here!” in the teeth of a snowstorm. Northern cardinals “pretty, pretty” on the coldest days of mid-February. And the irrepressible titmice, chickadees, and house finches sing no matter what the weather, proof to me that it is the lengthening daylight, not the temperature, that encourages their songs. But at least a small warming trend is needed to bring in the first eastern bluebirds singing “cheer, cheerful charmer,” the eastern phoebe’s low-pitched repetition of its name, and the wild “dee-dee-dee” of killdeer flying overhead. By the end of last February, the dawn chorus around our house included American tree sparrows, song sparrows, an eastern phoebe, bluebirds and cardinals. With the advent of March, the sounds of spring intensify. Canada geese and tundra swans sweep over the mountain day and night, “honking” and “woo-hooing.” Down in the hollow the first winter wren’s song echoes ethereally, and I plan many walks in hopes of hearing it. On the first of last March, though, I was doubly rewarded. Sitting on Dogwood Knoll, I heard the “cheerilee, cheerilee, cheerilee” song of a Carolina wren. After six years they were back on the mountain. I had last heard and seen them in the bitter January of 1992 when a pair of them had followed mouse tunnels into our basement to escape the minus five degree cold. Since then winter wrens had set up housekeeping among the tree debris spanning our stream and had partially filled the Carolina wren void in my life. Even as I rejoiced in the return of the Carolina wrens, a winter wren’s song also emanated up to Dogwood Knoll. Now, how was I to choose between those two marvelous songsters–the one otherworldly, the other very much of this world. Not all the birds are musical. The woodpeckers–pileated, hairy, and downy–usher in the season with drumbeats, the larger the woodpecker, the louder the drumming. One pileated likes a resonant tulip tree trunk a quarter mile from our house, but we hear him, loud and clear, whenever he hammers out his syncopated beat. Although red-bellied woodpeckers and northern flickers also drum to claim their territory, it is their calls–the “kwir, kwir” breeding call of red-bellieds and the “wick-a, wick-a, wick-a” of the flickers–that I listen for in early March. At the feeders the wintering dark-eyed juncos begin trilling by the second week of March and mourning doves “coo-coo-coo” in what sounds like sad surrender to the season. In the woods wintering brown creepers also start to sing what I think of as an upside-down eastern meadowlark song. Every winter we seem to have more and more wintering brown creepers, but although the March woods ring with their lovely songs, I have not yet discovered any breeding on our mountain. 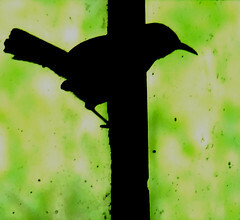 Years ago a pair of red-winged blackbirds persisted in nesting in First Field for several seasons. Since then, despite planting cattails in our small wetland to encourage their return, red-winged blackbirds have only been visitors, dropping in by the hundreds on an early March morning when the fog is thick. Dim black bodies swirl from tree to tree, the swishing sound of their wings magnified by the fog. Best of all, are their “o-ka-lay” songs, essence of early spring music to my ears. Then there are the robins. On a thawing day they sometimes appear by the hundreds running over First Field in search of food and “tut-tutting” with what sounds like self-importance to my human ears. But it is their beautiful, thrush song that I wait to hear, each male reverberating with as much resonance as its close relative, the wood thrush. Once in a while we are privileged to have a robin in residence who sings songs with greater variation and complexity than usual. I watch such robins closely to make certain the songs are really coming from them and not from some hither-to unknown bird species. Birds are not the only creatures I listen for in early spring. Sometime in March, depending on the weather, I hear the first ducklike quacking of wood frogs down in our tiny pond at the bottom of First Field. Their siren calls compel me to crawl through the dried weeds and ease myself up on the hillock that overlooks the pond. After a few minutes the wood frogs spot me and dive out of sight, so I sit down in front of the pond without moving for at least half an hour until one by one silent, froggy heads pop up. They watch me for a long time before they begin calling and bumping into each other as they test to make sure there are no unattached females in the pond. I sit there hour after hour, mesmerized by the calling, swimming, mating and egg-laying ritual of wood frogs in our six-foot-by-three-foot pond and I am always sad when the wood frog courtship season is over. Ruffed grouse intensify their drumming, and wild turkeys begin gobbling in early March. Ring-billed gulls wheel over the mountain by the hundreds, their calls evoking dreams of a summer beach. The downward “keeer” scream of red-tailed hawks frequently pierces the sky. But one late afternoon in early March, after a wind picked up, a pair of redtails emitted a new call as they circled above Sapsucker Ridge. To me it sounded like a tin horn, but the experts call it their “chwirk-call.” As I watched from the veranda, one hawk landed in what looked like the remnants of an old nest on the ridgetop, while the other flew overhead, its legs extended downward, as it circled, called and then landed in first one treetop, then another, and still another, as if it were pointing out possible nesting spots. It was performing the “talon-drop” display that redtails do to defend their territory or during courtship. One call that I listen for most springs, but rarely hear, is the “peent” of American woodcocks. But last March we heard more American woodcocks than we had during the previous 26 years we have lived here. Only twice before had we heard and then watched the male’s spectacular “sky dance,” as Aldo Leopold called it, near dusk over First Field. Spring officially arrived at 2:58 p.m. on March 20. But it was a disappointing day because it was raining hard and fog blotted out everything beyond our driveway. At 6:40 p.m., when my husband Bruce headed down to our mulch heap with the day’s garbage, he heard the “peenting” of an American woodcock near our barn. He ran back to tell me and our son David, and we rushed down to listen and watch in the light mist and dusky light. The show continued for 20 minutes more over First Field beyond the barn. Sometimes the woodcock flew directly overhead, but we couldn’t see anything except an occasional flash of birds’ wings, both because it was almost dark and the clouds were very low. The number of “peents” varied from five to seven to 12 to 27 before we heard him chirping above us during his song flight and then finally the whistling of his wings as he plummeted to earth. The “peents” seemed to come from several directions, even overhead, yet they are supposed to emit them only on the ground. Researchers claim that the displaying male rotates on the ground, which causes a directional change in the intensity of the “peents.” That may explain what we heard or, possibly, that one woodcock hadn’t read the books. Many eastern North American fields are used as singing grounds during the spring, but the functions of the peenting and chirping song flights have not been studied. Ornithologists assume that they are used to advertise the position of each bird to other woodcocks, but they often peent and fly when they are alone. However, if another male appears or a female visits, the display is intensified. Up to six males have been counted at one singing ground and, as they migrate north, they move from singing ground to singing ground where they also mate with whatever females they find. Most continue displaying and mating for two months once they arrive on their breeding grounds which can be as far north as southern Canada. They display twice a day, at dawn and dusk. At dusk they fly or walk to their singing ground from wherever they have spent their day and then, after their display, they fly to a separate place to spend the night or sometimes remain on the singing ground overnight. At dawn they fly back to their singing ground. Probably the length of their displays is triggered by light intensity since, on foggy nights, for instance, they begin earlier and end sooner. We have always assumed that our First Field was merely a stopover point for an occasional migrating American woodcock, although we have the habitat they like–young forest and abandoned farmland mixed with forest–at the boggy bottom of First Field. But our hopes rose that maybe we were nurturing a breeding female three days later when again an American woodcock displayed in the lower First Field at dusk. We even had a marvelous view of his overhead flight because the evening was clear. The following evening still another display occurred. On the twenty-eighth of March, as we sat on the veranda near dusk, an American woodcock flew past low to the ground, but it gave no display. That, it turned out, concluded our woodcock appearances and we found no woodcock nests. Those sky dances, though, were the highlight of last March’s spring concerts. March ended, as usual, with two beautiful sparrow songs. First were the downward spiraling songs of returning field sparrows who breed in both the overgrown First and Far fields. They were followed by the mournful “poor Sam Peabody, Peabody, Peabody” songs of migrating and wintering white-throated sparrows. By the last day of the month our yard, the woods, and even the hollow were filling up with bird music. After a dawn chorus of American tree sparrows, mourning doves, field sparrows, robins, cardinals, song sparrows, juncos, phoebes, bluebirds and house finches, I listened to white-throated sparrows, cardinals, and the just-returned male eastern towhees along Greenbrier Trail. From the depths of Dogwood Knoll an especially enthusiastic towhee flew up, perched on a nearby shrub, and loudly proclaimed his name over and over more than 100 times without stopping. Then a pair of hairy woodpeckers called to each other. As I watched, the male landed high in the tree where the female was foraging. Calling loudly, he mounted her for no more than a second and flew off, reminding me that that is what all the sounds of spring I was eagerly listening for are about.